ENERGY SAVING ALUMINUM AWNINGS SINCE 1968! CLICK ON THE PICS FOR MORE PHOTOS! Sometimes the most sustainable solution is the simplest. Weather Whipper aluminum awnings have tackled the outdoor elements for more than 60 years! An energy efficient product that saves you money! The style, venting, color and angle of aluminum awnings give you greater resistance to direct sunlight, wind, snow and rain. Best of all you never have any operating costs, there are no adjustments to make the only maintenance required is a simple cleaning now and then. Energy is lost through glass doors and windows more than any other construction element. On a hot day more energy comes through a one foot square of glass than the entire insulated wall. Solar radiation through glass is responsible for approximately 20% of your air conditioning unit. Aluminum Awnings reduce direct sun's heat by as much as 70% and interior temperatures as much as 15 degrees. Weather Whipper aluminum awning styles allow for ventilation either through the tops or sides of the awnings. Ventilation allows for more airflow, which reduces the heat buildup directly under the awning. OUr specially designed awnings accommodate ventilation differently with each design for maximum reduction of heat build up. Weather Whipper awnings are made of aluminum for a longer lasting product and have durable baked enamel finishes, which are more resistant to fading and staining. If you are in an area prone to hail damage, we offer rigid vinyl awnings. Weather Whipper's three distinct style of aluminum awnings-ventilated, non-ventilated and horizontal - give you the choices that best accommodate your protection against the elements. With nine different design choices you are sure to find a style and design that best fits your home or office. Weather Whipper aluminum awnings have a wide variety of colors to help compliment your look. White awnings absorb less solar heat and reflect the sunlight where dark colors absorb the heat. Use of accent stripes with your polar white awning personalizes the look of your home or office. Many color choices available. 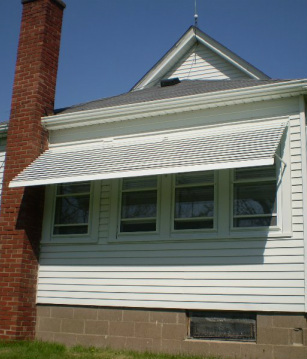 Weather Whipper awnings keep your home cooler in the summer and warmer in the winter! Awnings can reduce direct sun heat by 70%. Keeping the hot sun and cold weather outside makes temperature control easier and helps lower your indoor cooling and heating costs. Rated for snow loads, and built to last with quality maintenance free aluminum or vinyl, Weather Whipper awnings is an ideal solution for your home. Weather Whipper doorhoods and window awnings are made of aluminum with double baked enamel finish.Awnings are factory assembled with stainless steel screws and shipped in either three or four pieces,depending on style ordered, top and two ends and valance options. Easy instructions are included for quick assembly. Backed with a 10 year limited warranty, with 9 styles and several colors and aluminum or vinyl to choose from, your Weather Whipper awning not only adds curb appeal but assists in reducing your cooling and heating bills. We'll help you choose the style and design that looks best and delivers the comfort and energy saving performance that you need. Visit our showroom at 345 W 7th Street, Davenport, IA.